We started the day with “Wake Up and Walk Wednesday,” which will run for the entire spring semester. This activity encourages both staff and students to arrive at school at 7:20 a.m. for a refreshing 20 minute morning walk with friends. For this event, we were hoping to have at least 20 students show up--instead, we were pleasantly surprised when we had over 100! In addition, we had 17 energetic staff members participate and interact with the students. Staff and students met in the gym (due to frigid temperatures) and walked laps together. When weather permits, we will walk or run outside the perimeter of our school. The students and staff members both seemed to enjoy interacting with one another in this stress-free environment. We also added Zumba classes during each grade level’s PE time and after school for our staff members. This activity allowed all of our 456 students and 54 staff members to participate. Our incredible guest Zumba instructor reinforced the healthy reasons our bodies need to stay active with kid-friendly lessons, and she did a phenomenal job of motivating even the most reluctant students to participate. After each 30 minute class, students also had a lesson on nutrition and healthy eating. Everyone really enjoyed learning a new way to exercise and move their bodies! It was so much fun to watch the excitement on the students’ faces as they learned the Zumba routine! To encourage staff participation on this day, we also offered nutritious food from La Madeleine for lunch. This helped fuel their bodies for their Zumba class after school! These activities were chosen because we knew they would be highly motivating and extremely fun for everyone! We can tell these activities are going to make an impact on creating a healthy school environment because of the positive feedback and participation from our students and staff. We also feel that these events were successful because they were fun, easy to manage, and low cost. Our biggest barrier was that on inclement weather days, our gym was bursting at the seams with the large number of participants. It limited the pace of the walkers, whereas outside all could participate at any pace desired. Other than that, everything else went very smoothly! If your school isn’t currently offering a school-wide fitness activity, we would encourage you to give this one a try. We think you’ll be excited about all that it offers – activity, energy-burning, and an opportunity for fostering relationships between students and staff in a positive environment where everyone succeeds. 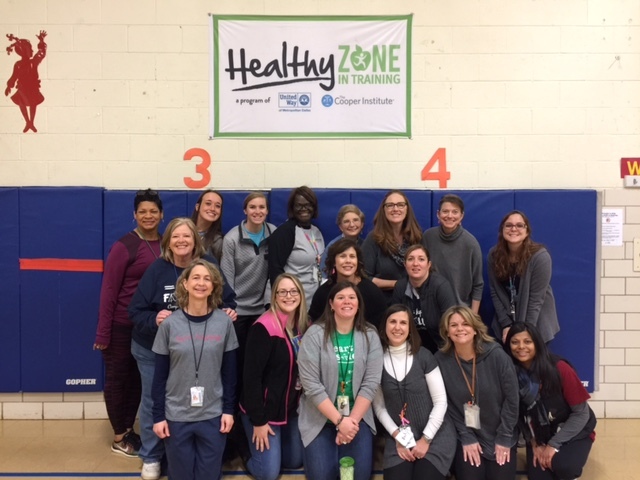 We are so thankful to be part of the Healthy Zone family and look forward to greater school-wide health and fitness!